The clutter from toys can be maddening. Even after the kids are long asleep, it can feel like there is no end to playtime when you don’t have a place for everything. 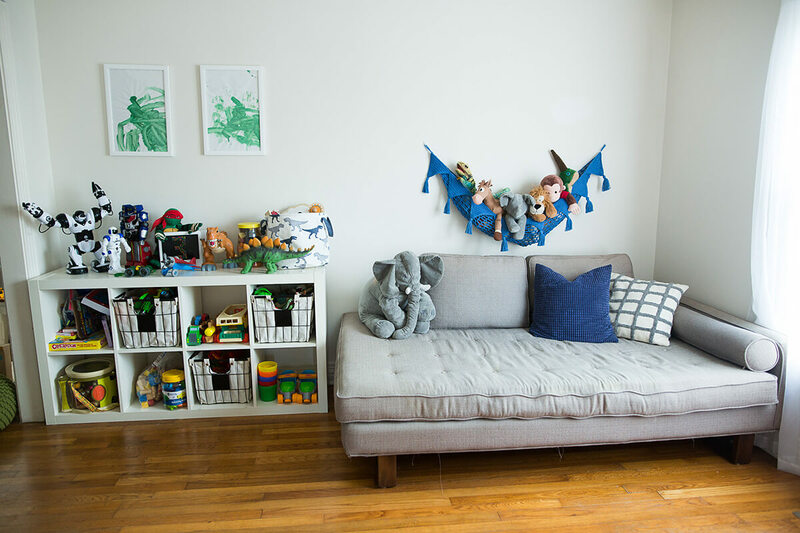 That is why these 38 toy storage ideas are going to change your life – and your living room. 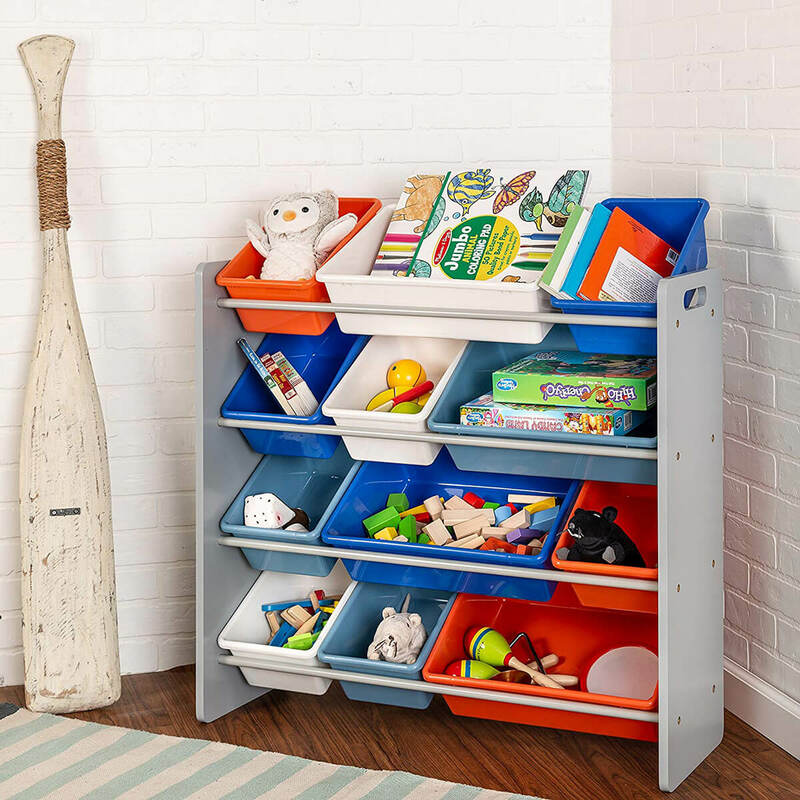 No matter how big or small your space is, there is certainly a toy storage or organizing idea that will suit your needs. Of course, it’s not just your needs that are on the table: your child may also have certain preferences that shape what style and color you decide to go with. That’s why having so many options on this list is useful. It will help you find something that speaks to you but also fits in with your child’s taste and bedroom theme. You can simply purchase or replicate these ideas as they are, or, if they don’t fit your space quite right, you can get clever and modify them to accommodate your living arrangements. Ranging from simple and neat to colorful and fun, each storage option offers something unique. Just be sure to think through what you need and the space you have, and then get to organizing. 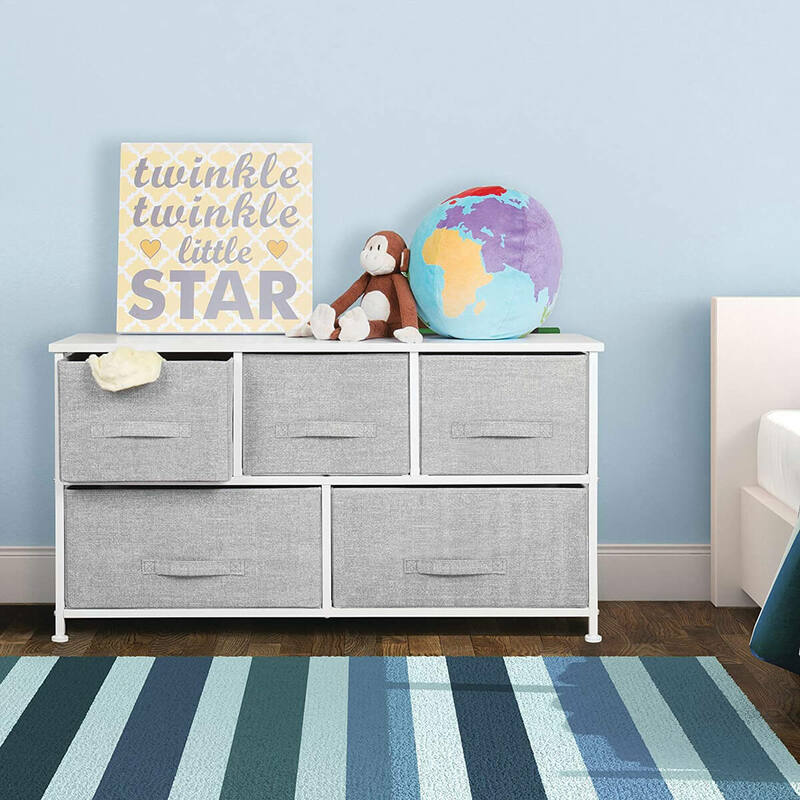 Coming in a gender-neutral gray and white, this short and sturdy dresser will go with most any nursery design. Your child will be able to easily open and close the soft linen drawers, which may encourage them to help with pickup. With many other matching pieces, this option is great if you are thinking of adding more furniture. 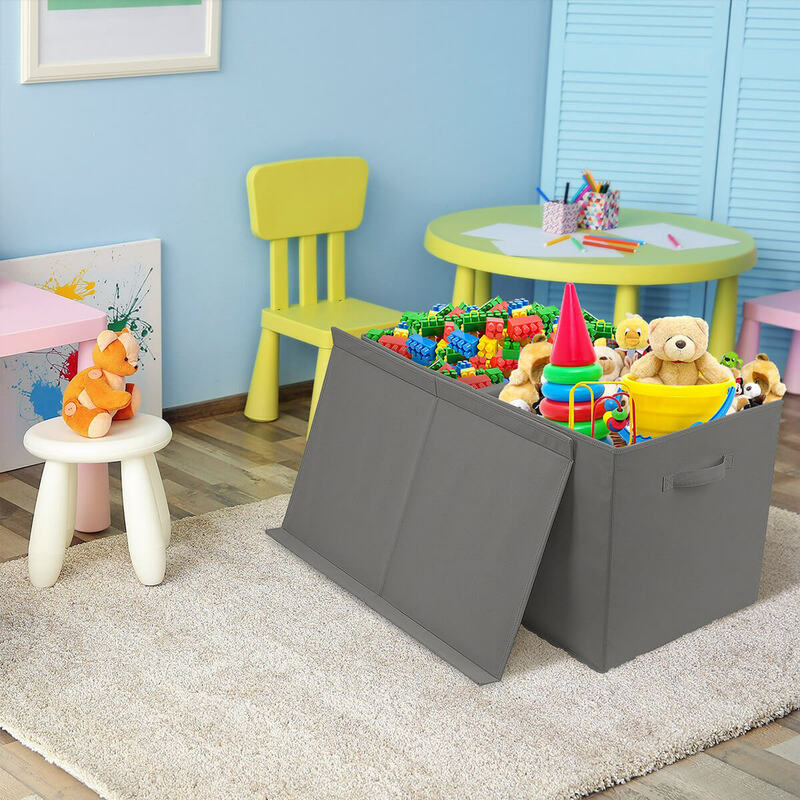 This gray soft linen toy chest draws inspiration from the classic design, featuring a wide compartment that can be left as a single open space or split into two compartments with a divider. The best part about this piece is the fact that when you aren’t using it, it folds up flat for super simple storage. There is hardly anything more satisfying than multi-functional storage. In this case, what appears to be a bench is also a treasure trove of your tot’s favorite toys. This bench is nice and wide, allowing you to store many toys. You could even add your own cushions or pillows on top to pump up the decorative aesthetic. While it can be nice to tuck away all the toys in a chest, large storage devices can make finding what you are looking for a bit tricky. That is where bins save the day. The slight tilt of each of the four levels ensures you can always see what’s inside each of its twelve bins. Sometimes, especially in a smaller space, going wide isn’t the best option. Instead, consider a dresser that stands tall like this one. 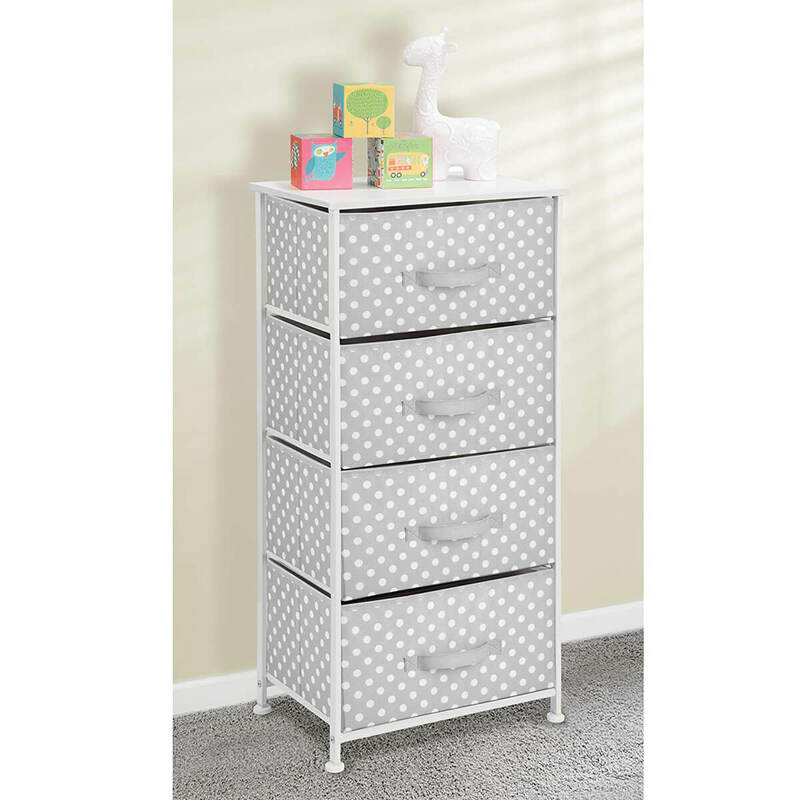 Perfectly suited for any little girl’s room, the adorable pink and white polka-dotted fabric drawers are sturdy and easy to use. With spacious drawers, you may even have room for clothing and accessories, too. After a fun and exhausting playtime, it can seem like the best idea is just to roll the carpet up and store everything away in a second. 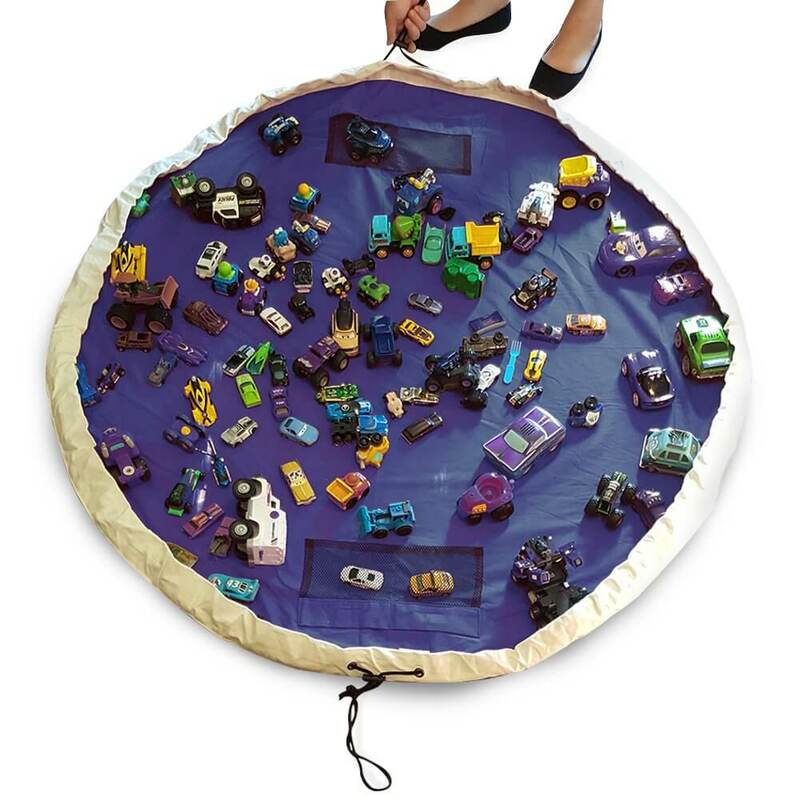 This amazing play mat means you can, making clean-up an absolute breeze. The mat itself converts into a storage bag in seconds, leaving you with a tidy, mess-free space. 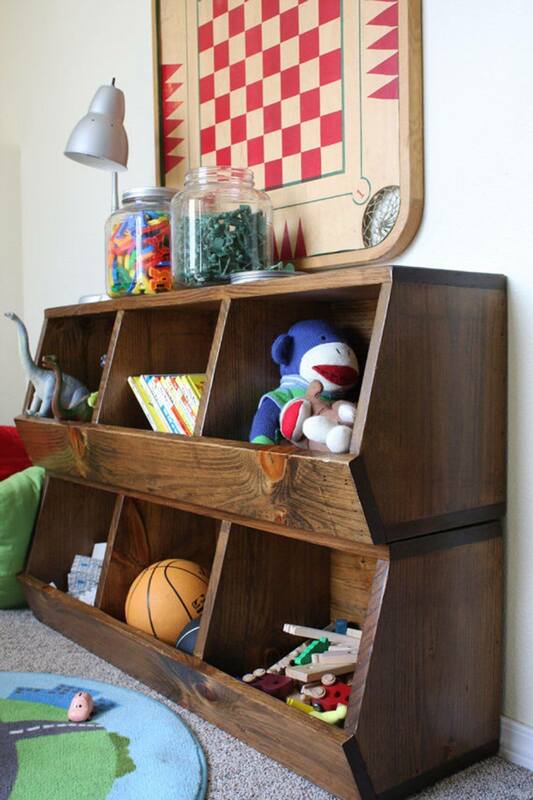 Canvas is a great material for children’s storage. It’s soft, durable, and easy to use. This particular canvas chest takes the design level up a notch by adding an adorable animal to the front of the box. With twelve different options, you will be sure to find one of your kid’s favorite creatures. This storage bin is designed with safety in mind and comes with easy-to-use wall anchors. 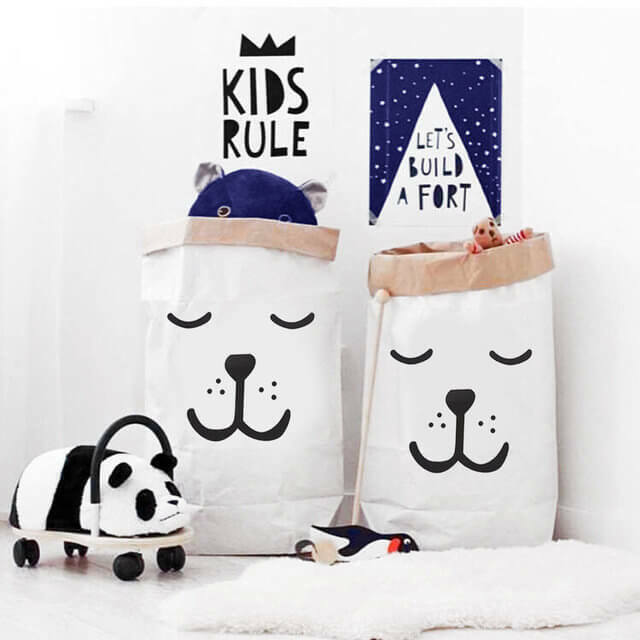 Of course, in kids’ eyes, fun is just as important as safe, and with these bins, your kids can add their own creative touch with customizable stickers of all different shapes for the bins and the sides of the tower. If you have a little princess in your life, this petite toy storage bench is a wonderful choice. 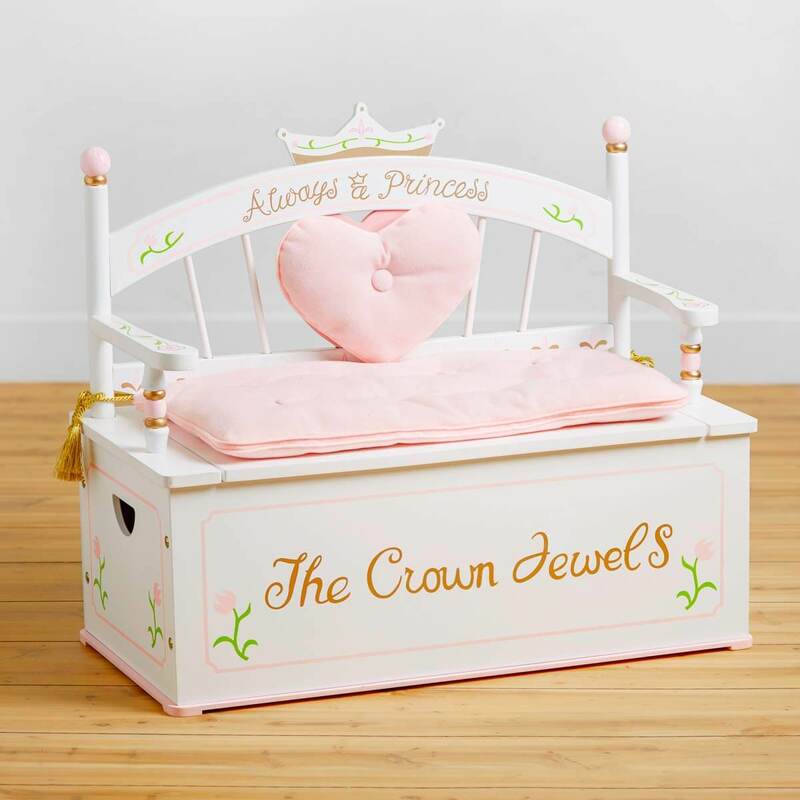 With a beautiful design and sweet cushions, this toy box is practically made for royalty. In fact, if you didn’t know that it was a storage bin, you probably wouldn’t even notice its practical functionality. A perfect addition to your royal cutie’s room. Sometimes it seems like everything ends up shoved in the closet. With this hanging organizer, you can take back that closet space and make it into something functional. 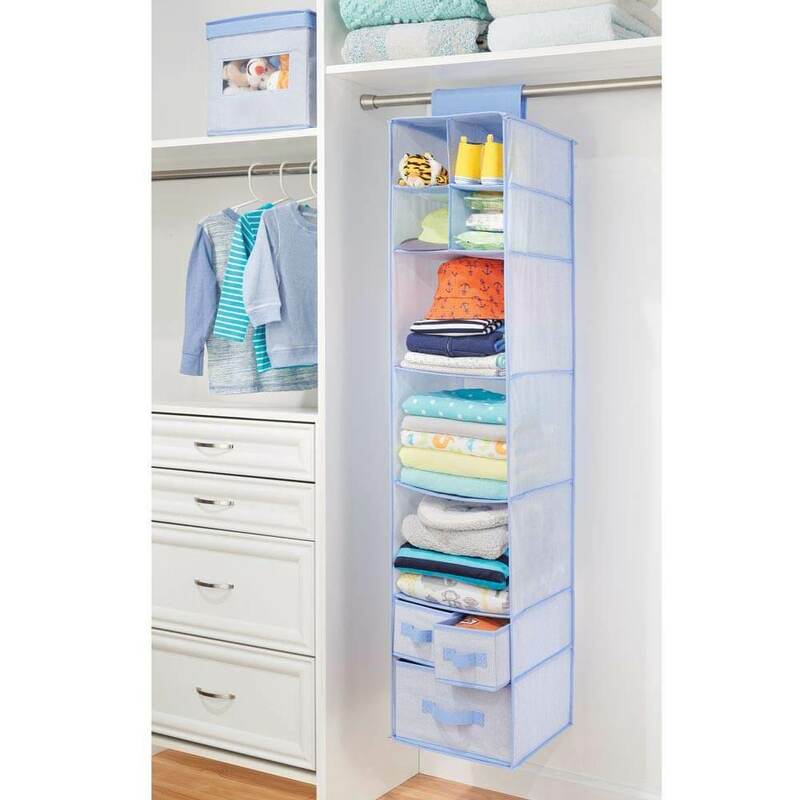 This closet hanger offers a few small drawers, three large cubbies, and four small cubbies to provide you with more than adequate storage space. Great for the child who adores all their stuffed animals, this toy chain not only stores furry friends but displays them, too. When bears and dogs are thrown in a box, it can be hard for your little one to find the special buddy they want to take along. With the toy chain, all animals are always visible for easy finding. 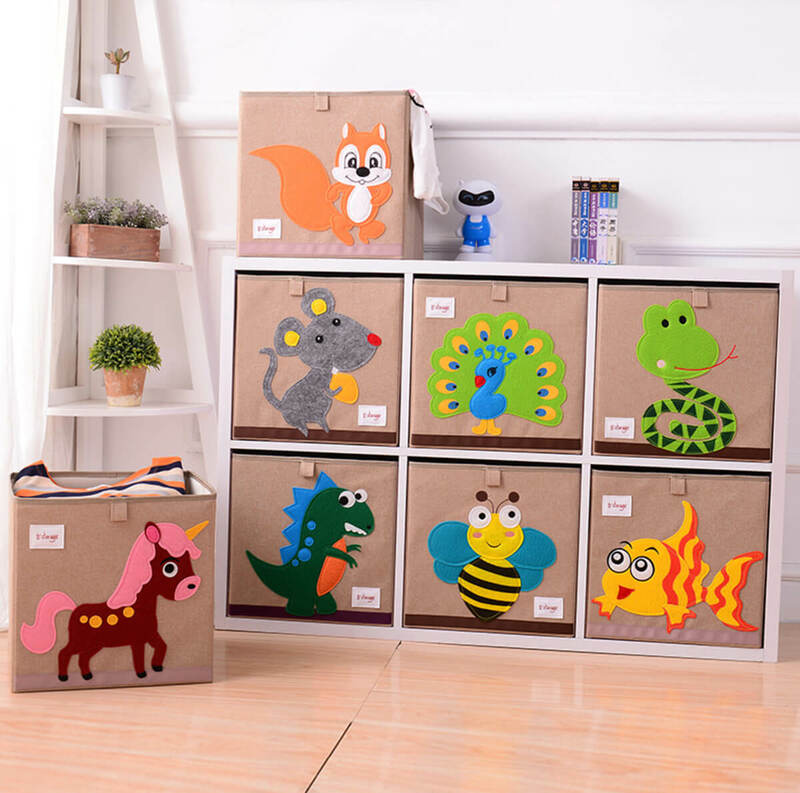 On this fun and playful door organizer, four individual bins work together to create a fun animal pattern. 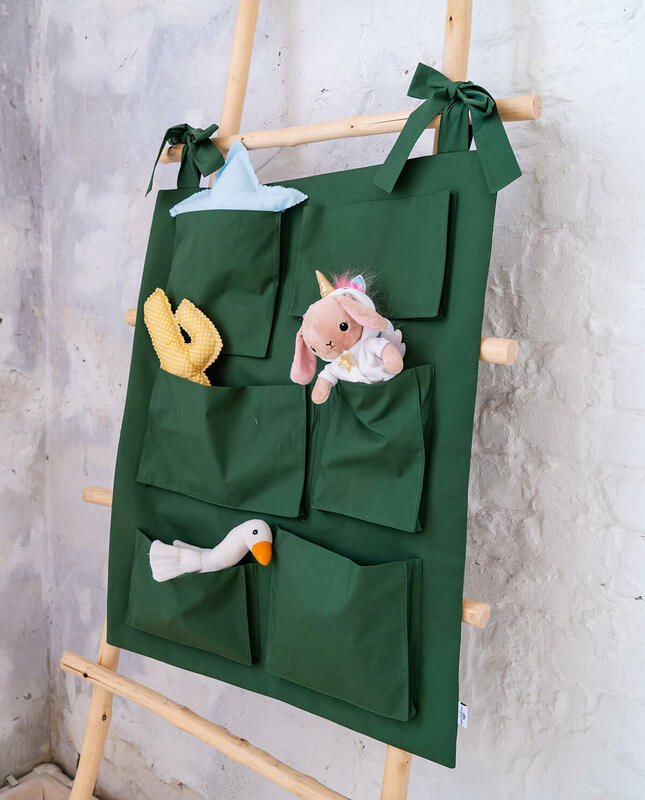 This hanging storage doesn’t take up much space and can hold anything from books to toys to dolls. 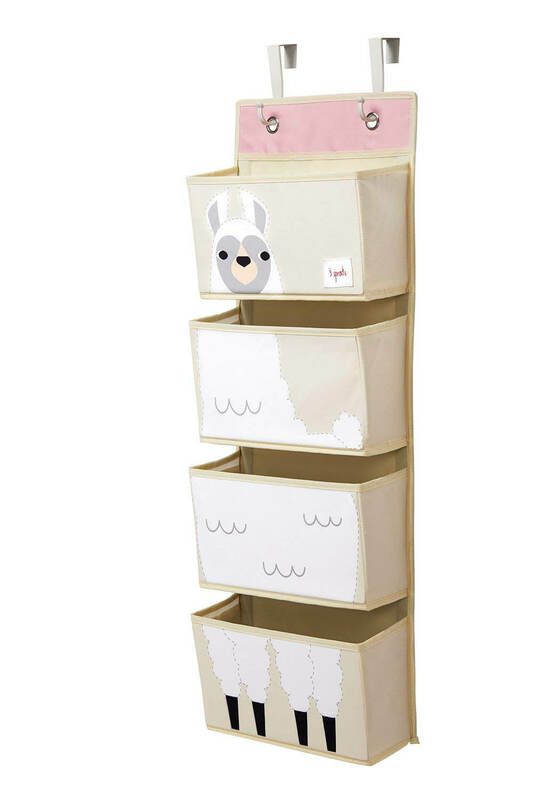 With four animals to choose from, this storage option will work in any bedroom or even in the bathroom for all those bath toys. With four large pocket shelves, this organizer gives you somewhere to store those stacks of books that tend to end up everywhere. Thanks to the bedtime theme, picking out a story each night will be easier than ever. Even better, the pockets are wide enough to hold your favorite nighttime stuffed buddy or security blanket. Most kids love bath time, and one big reason is the awesome toys. Keep all their favorites together with this handy adjustable bath toy basket. 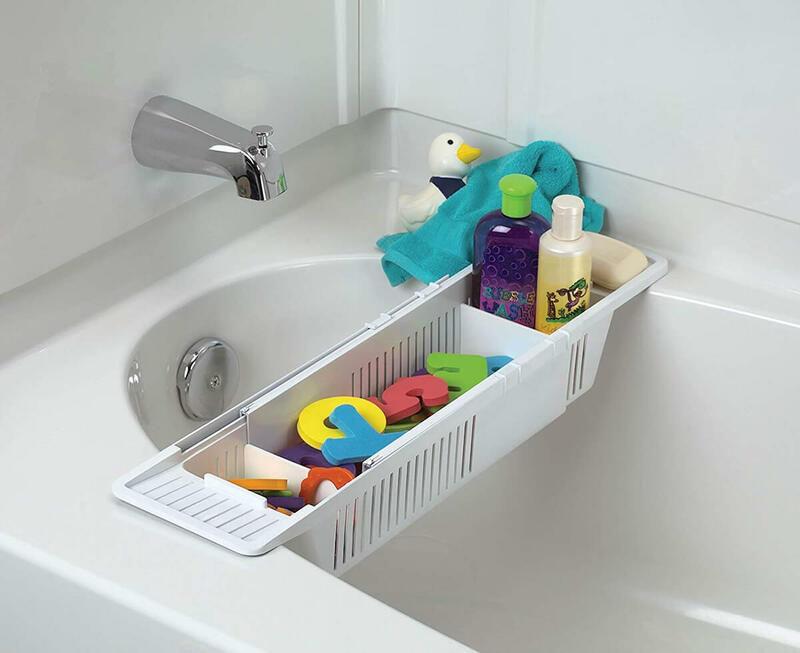 With spots for soaps as well, this bin is not just playful but helps keep every element of bath time well organized. There is something about a reading nook that makes you want to curl up with a good story, and most parents will do anything to get their kids interested in books. 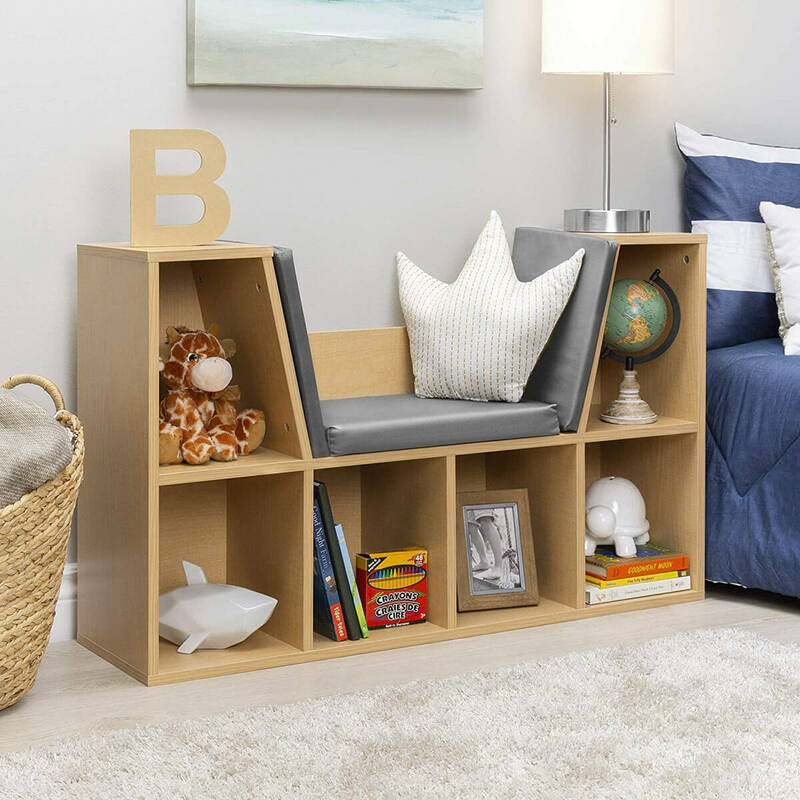 With this special little space, kids can store their favorite stories and toys in the six individual cubbies that surround the cozy double-sided bench. 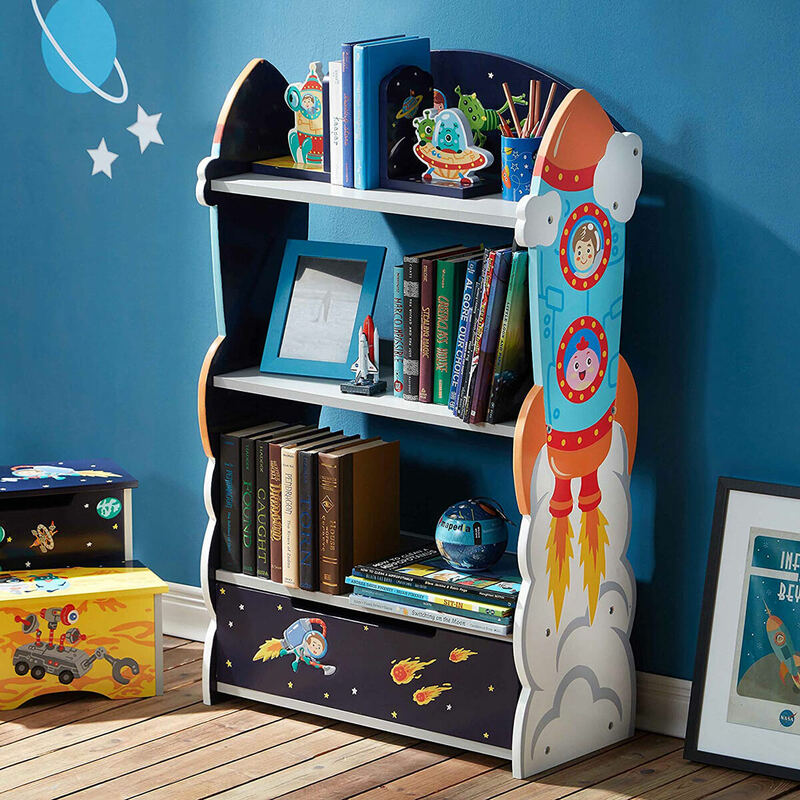 If you have a little space cadet on your hands, then you will want this beautiful, elaborate bookcase. With a single drawer, you can store all of those favorite books, puzzles, and art supplies both on and in this lovely piece of furniture. Bright colors and an awesome rocket ship will make this a bedroom focal point. Offering nine different containers in three sizes, this fun and playful storage bin is great for the Disney lover. 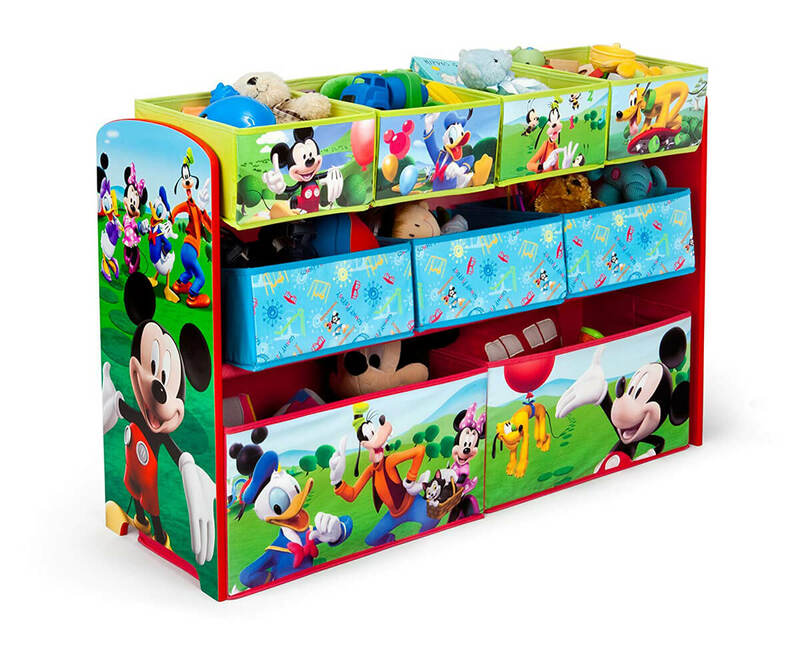 Mickey and his favorite pals welcome play time with bright and bold colors. Having these characters greet you during clean-up makes it almost as fun as playing. The chest comes in three other Disney-themed designs to suit your child’s taste. 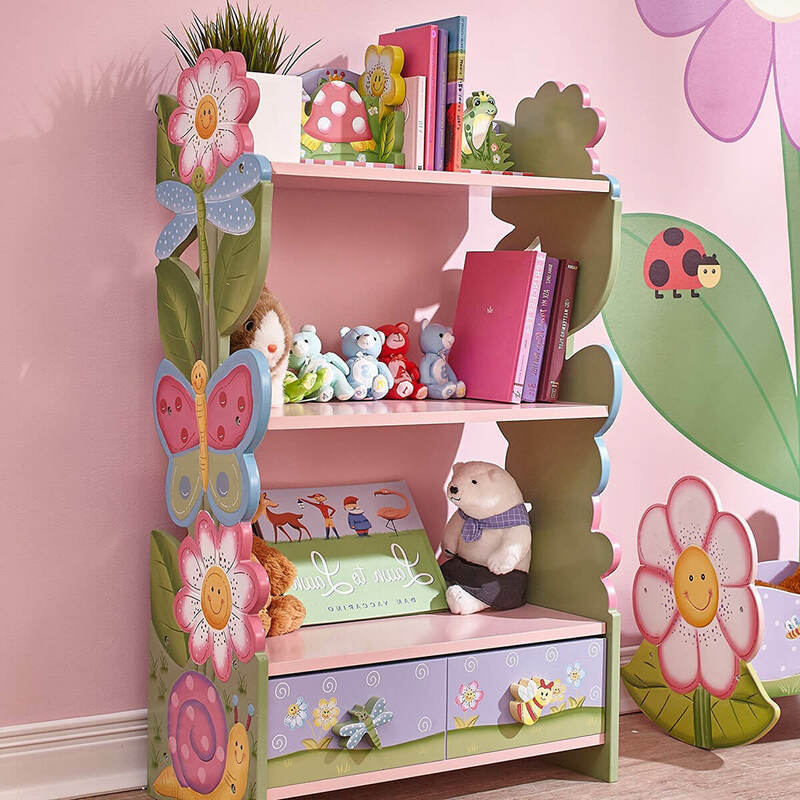 Lovely flowers, butterflies, and other garden friends adorn this adorable bookshelf. With its bright colors and fun designs, this is the perfect blend of convenient storage and fun décor. The two drawers at the bottom offer some hidden storage and cute critter handles. 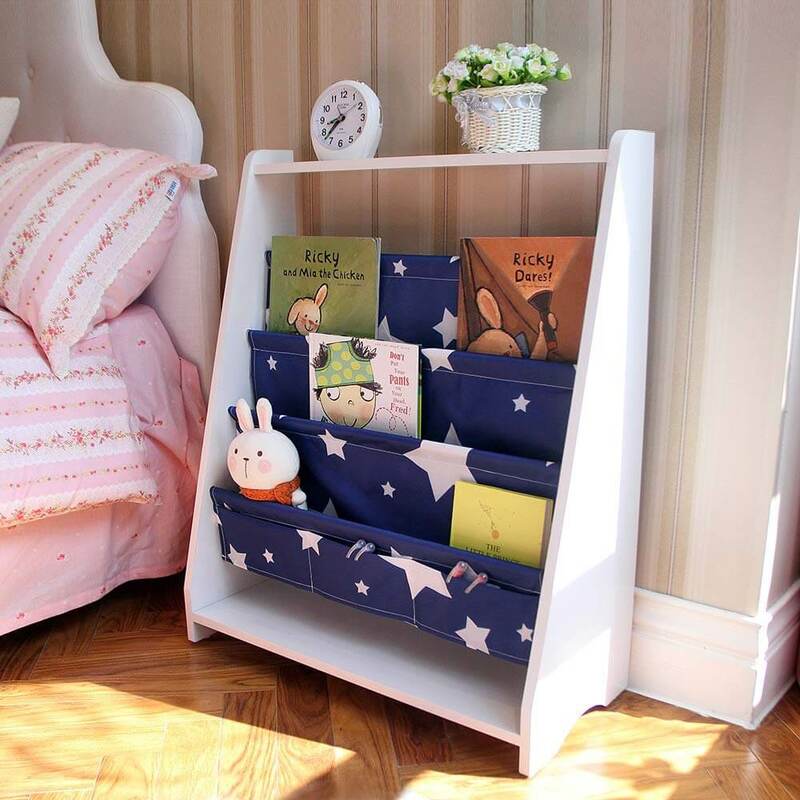 Stick with just this exact book case or decorate the whole room with this super sweet theme. Coloring is a highlight of childhood. Getting to add whatever color you want to a blank canvas is a fantastic early form of expression. 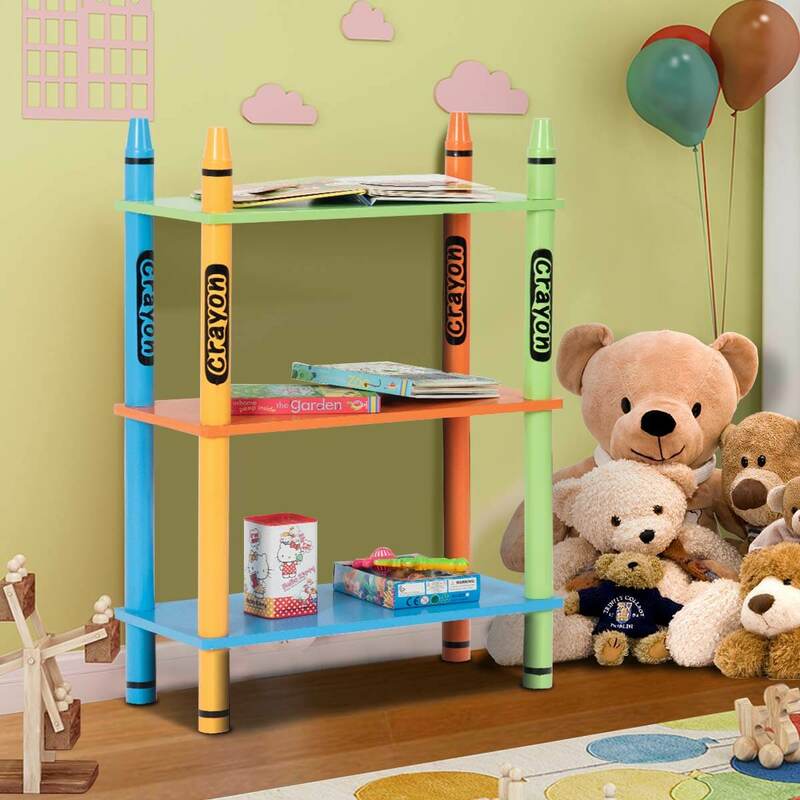 Pay homage to those fun colorful sticks of wax with this brightly colored three-tier shelf. With plenty of room between each level, your storage options are vast. For a charming and chic look, try these classy toy box tags. Easy to attach with tape or glue, these beautiful words can be added to any drawer. And, since they are totally customizable, you can decide how many of the wooden tags you need and exactly what each one should say. 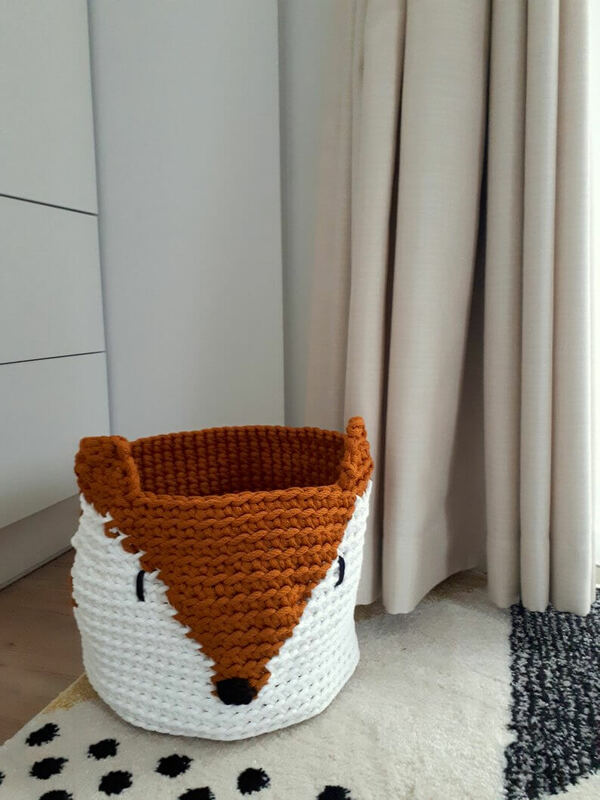 This handmade fox basket is a top-notch organizing idea. You simply add this decorative basket to a messy place, and voila! You suddenly have a new cute storage bin to keep everything in order. Because this item is made to order, you can get it in any size you want. 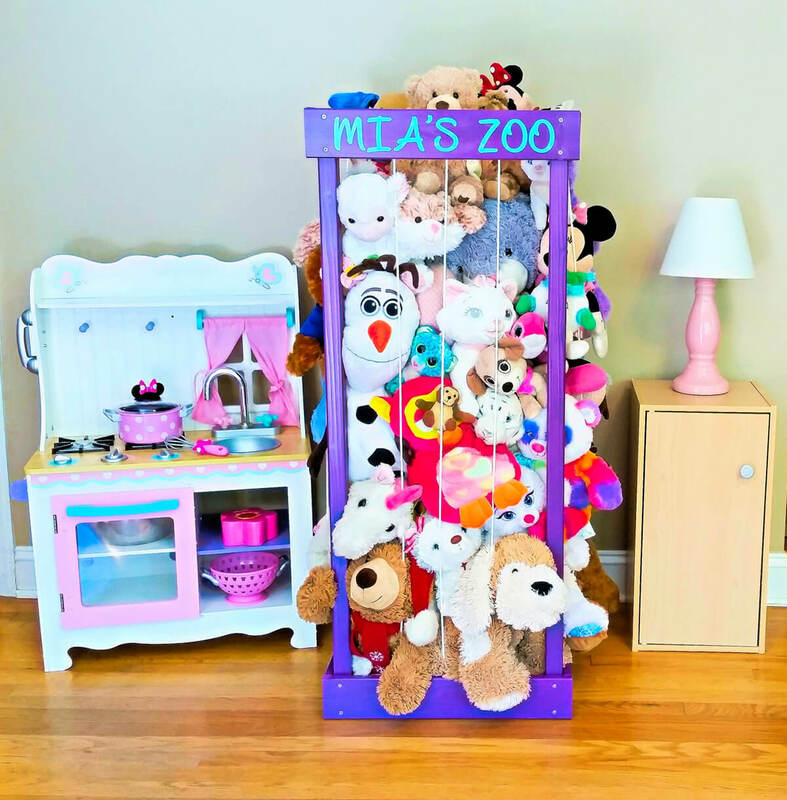 When you start to feel overcrowded with stuffed friends, this “zoo” is the perfect place to keep them all. Made in any color and with any personalization you like, these wooden beams and flexible strings will keep all your critters in place while ensuring that they are easily accessible. Let your soft stuffies hang free in this adorable corner hammock. Available in 13 different colors, you can pick the one that best matches your child’s room. This net is perfect whether your kiddo has a small petting zoo of animals or a whole wildlife preserve, as it can be made in different sizes to fit all of the favorites. 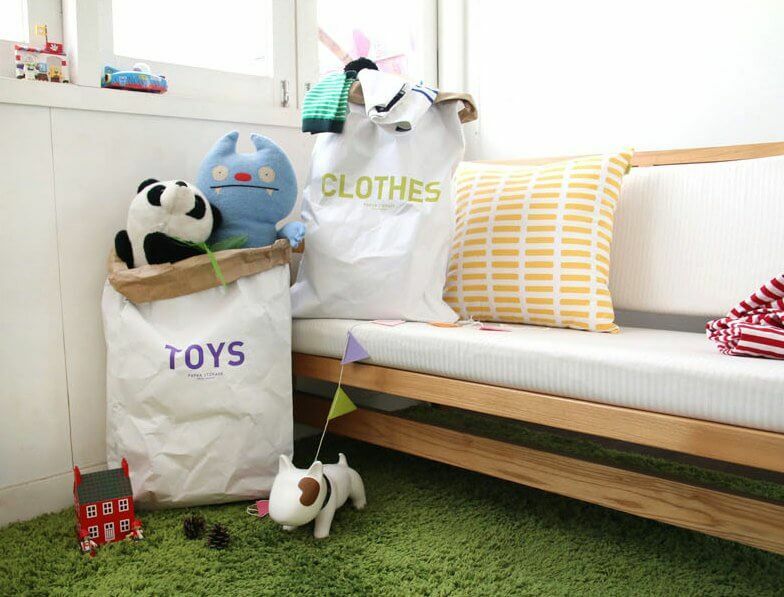 A new take on the typical storage bin, these oversized bags are made from durable craft paper. With a natural brown inside and a beautifully printed outside, you can customize the design to match your space with whatever makes you smile. These bags come in so many sizes that you can use them in various spaces throughout the house. Adding just one of these friendly and functional baskets is great, but even more fun is having a whole group of them. Since they are available in customizable colors, you can get all your favorite pairings for a cute design addition and a storage solution all at once. Be creative and pick expressions that represent you and your children. Slender pockets make this fun wall hanger the perfect place to drop off homework after school, stash those favorite books, or store that favorite bunny. 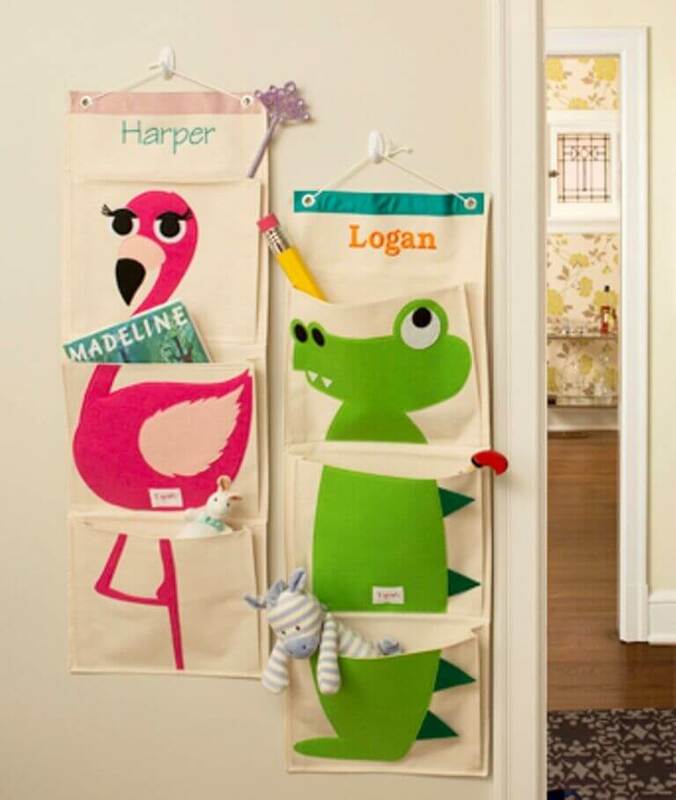 Easy to hang anywhere and customizable with your child’s name, this handy additional storage option will fit in nearly any room. A clever organizing idea is to move storage to the walls. 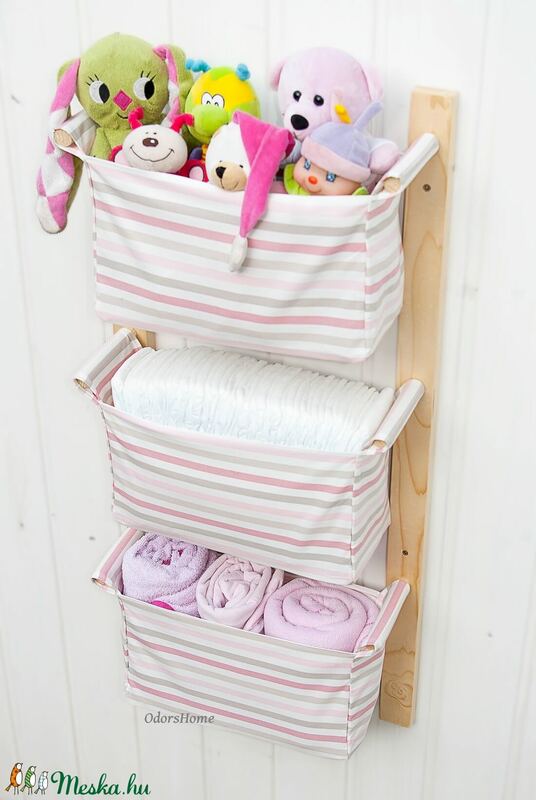 Floor space is often hard to come by, so when you find yourself needing some extra walking room, consider something like this awesome hanging basket organizer, which is perfect for diapers during infancy and then toys and games as your child grows. Using storage spaces to also decorate is such a winning idea. 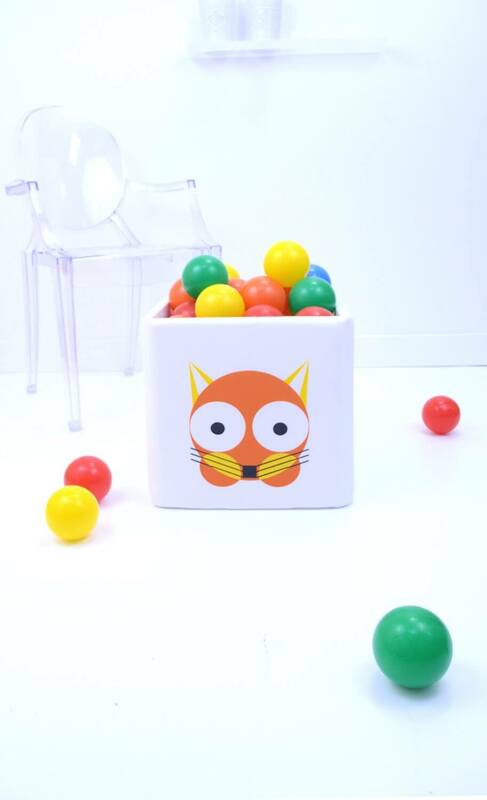 Why waste all of that space on plain, boring boxes when you can upgrade to something cute and creative like these playful fox-themed boxes? Measuring 11”x11”x11”, these boxes will fit into most organizers and will bring you and your child joy every time you pull something out. Thanks to its long canvas ties, you can secure this awesome pocket organizer to many different places in your home. 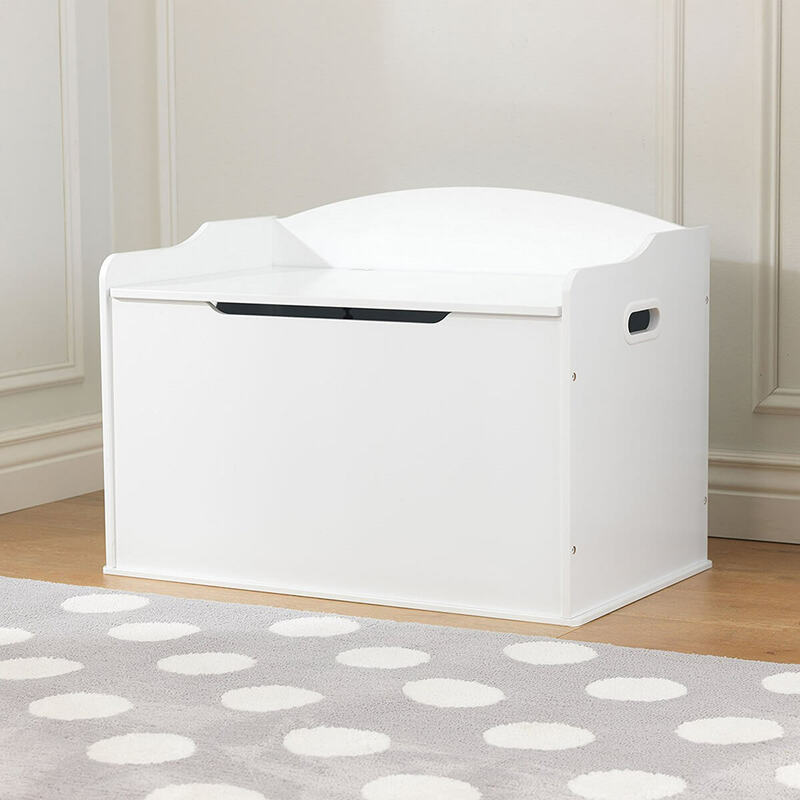 Great for a nursery or child’s bathroom, it can hold toys, games, snacks, or toiletries and is designed for easy access. If there’s a certain toy you want to make sure you don’t misplace, you could even designate a special pocket just for it. 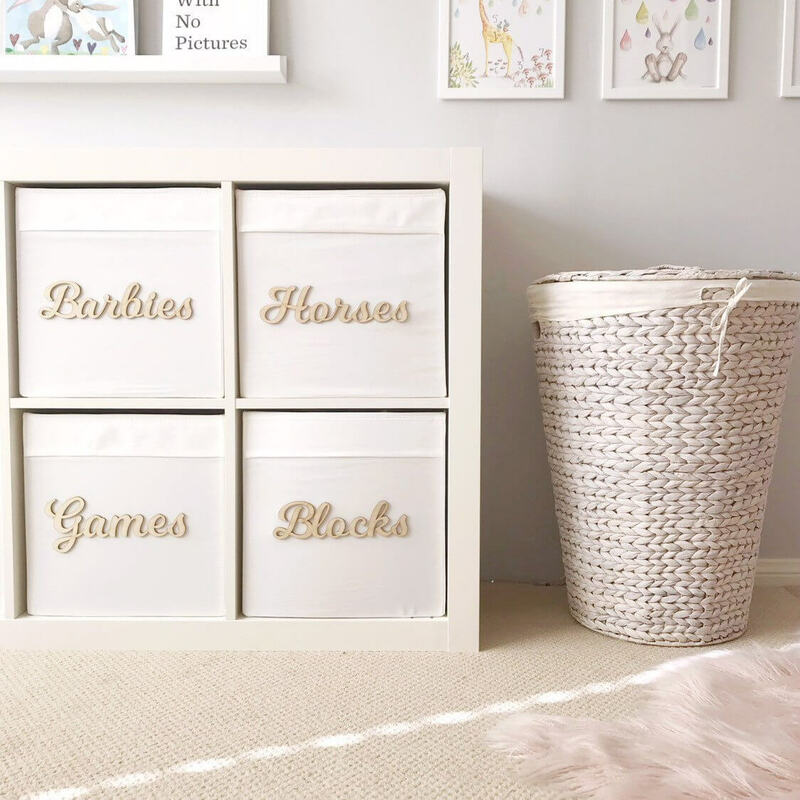 These beautiful white paper storage hampers are ideal for any kid’s room that is accumulating clutter. The hampers come with the option to customize the front with either toys or clothes, so consider getting both and teaching your children how to properly use each one for maximum storage efficiency. 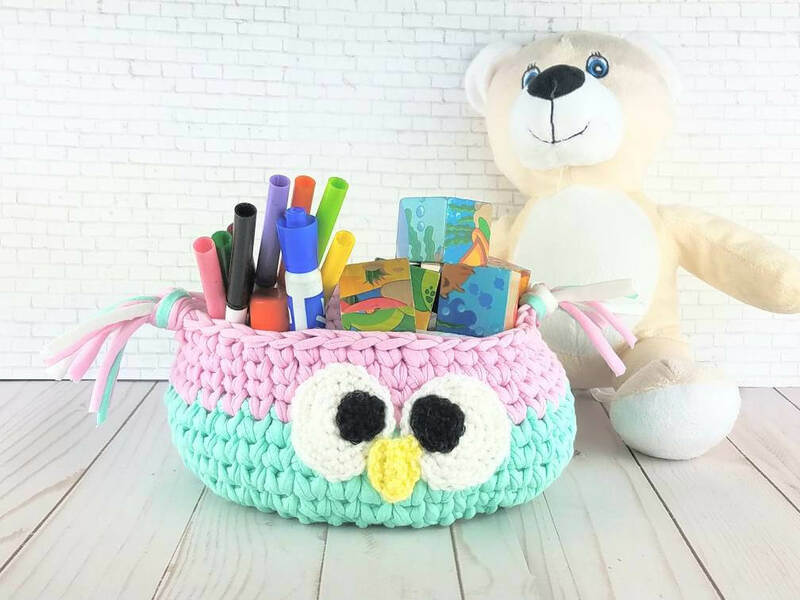 All your little one’s little friends can fit in this oversized beautifully crafted storage basket. 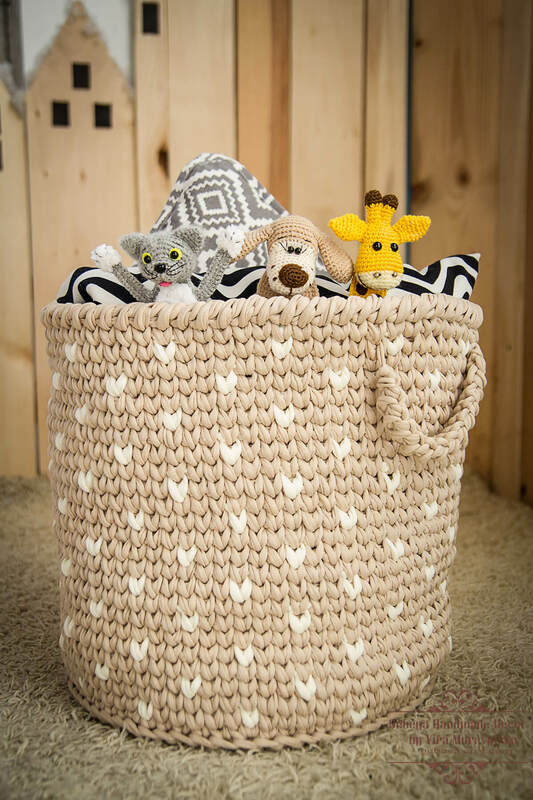 Large sturdy handles make it easy to move empty or full, and the thick hearty yarn mean that this basket will last your family a long time. Simply pick your favorite colors and enjoy the benefits of a stellar storage solution. 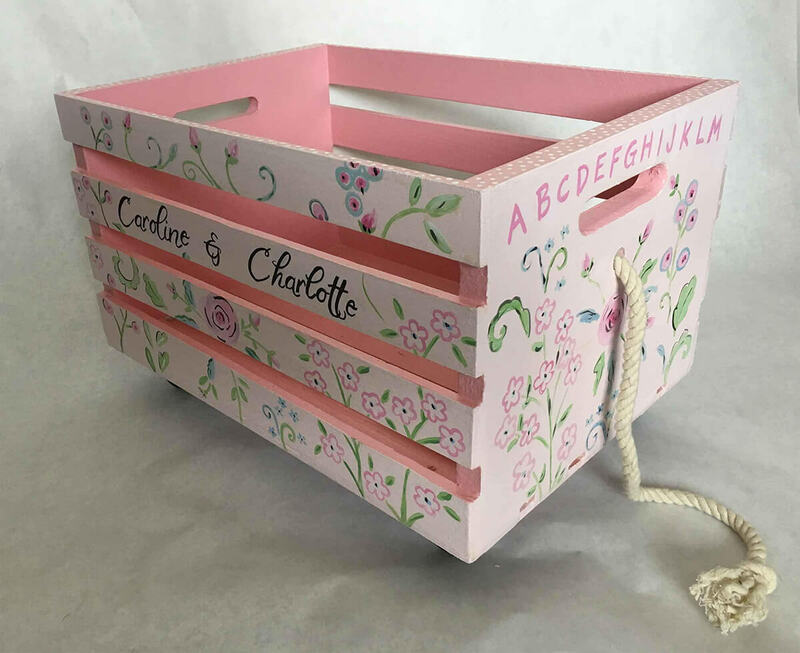 Delicately hand painted, this pretty storage box offers a fun twist – wheels. Thanks to its classic twine rope attached, your child can load up some favorite toys for a parade or easily move playtime from one room to another. The box includes your child’s name and a fun and educational alphabet along the top. 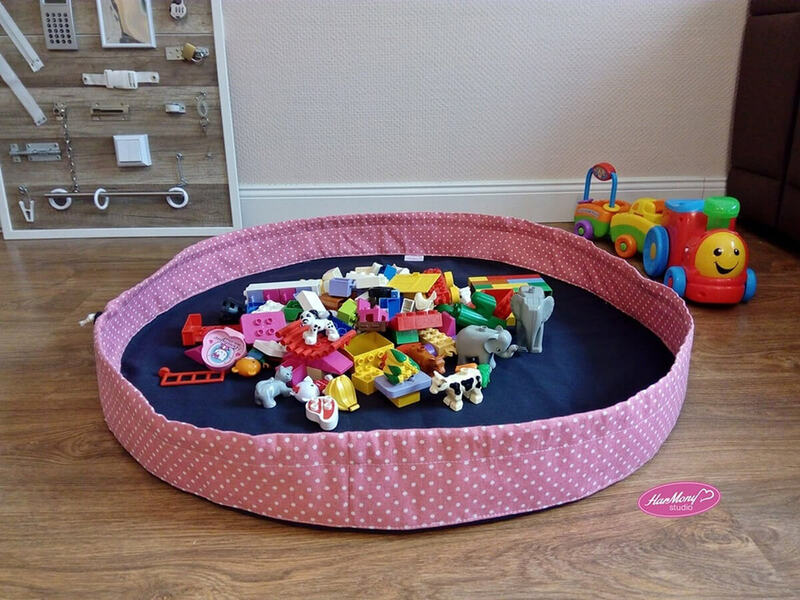 With stiff low walls and a soft bottom, this play mat will accommodate children starting at a young age. They can explore the mat and toys freely on their special space, feeling safe and secure. Then, when playtime is over, you can simply push the toys to the middle and cinch the strings for an easy transition from mat to bag. 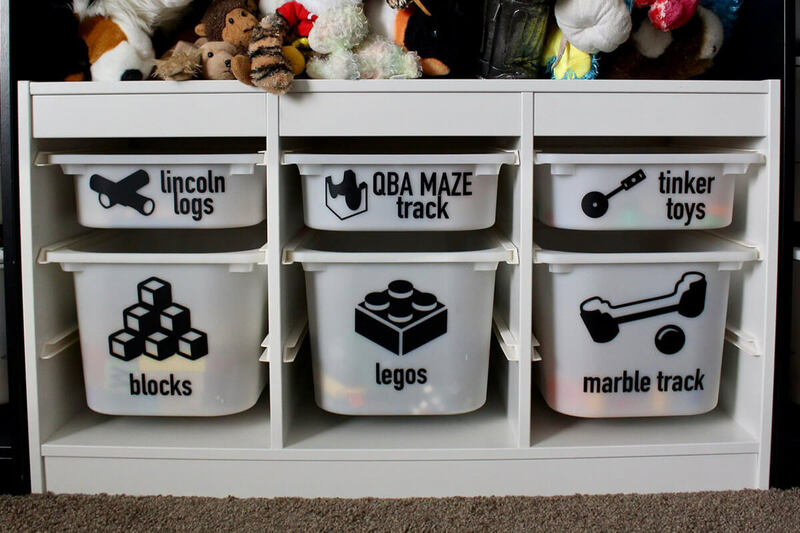 If you are inclined toward craft projects, then making your own storage bins is an obvious solution. However, sometimes coming up with the design can be easier said than done. That is what why these plans are so handy. They serve as a guiding tool for your own creative process, pointing you in the right direction. 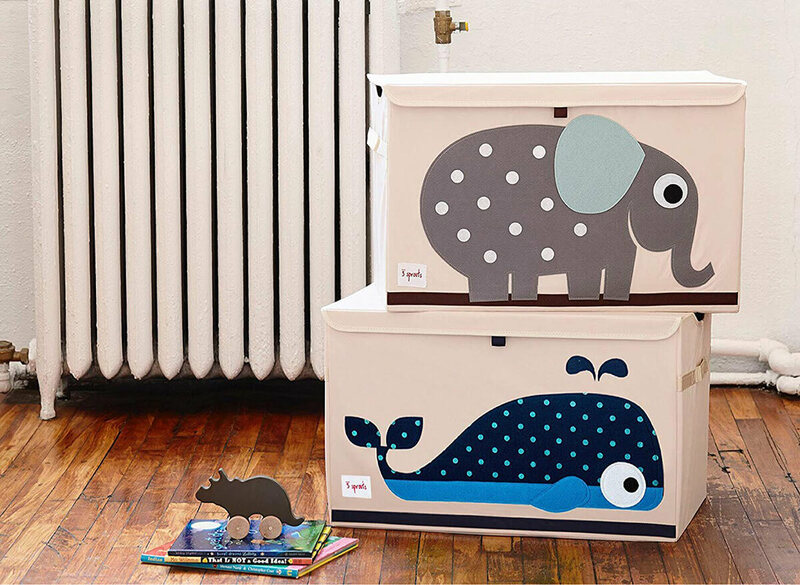 If you are looking to dress up your storage bins, then these cute critters are the perfect solution. They are available in twenty designs, meaning you can buy as many as you like and rotate them in and out. When not in use, they fold up easily for neat storage. Also unique to these cubes is that they come lidded. If you love your storage solution but are still having trouble finding everything, consider getting these awesome labels. With both pictures and words, these labels are wonderful for children who may not have learned to read yet. Just be sure that these stickers will work on your bins before ordering. 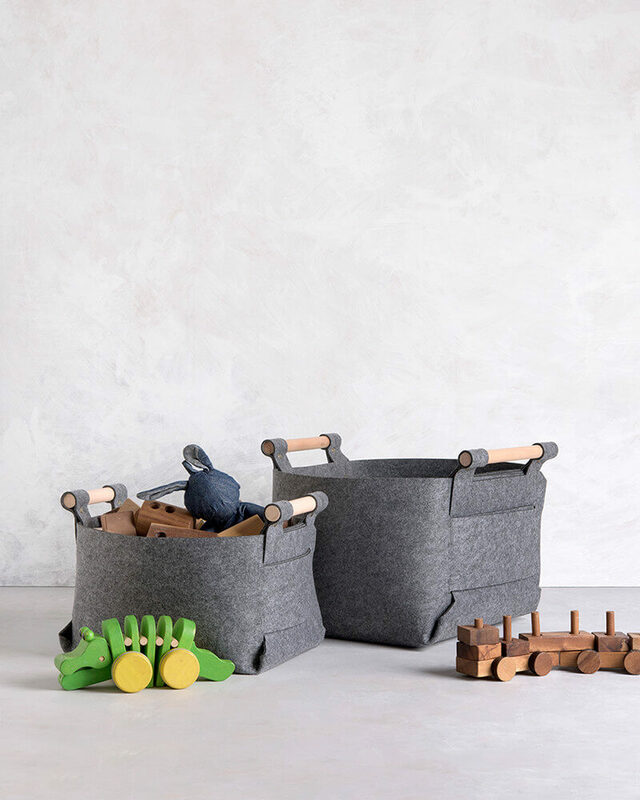 These thick gray felt baskets make for great toy bins. They are sturdy and fairly large and offer customizable colored handles. Pick a cool peach or a bright light blue to match your room design. Useful on their own or as a pair, you can mix and match the color of the handles to vary the look. 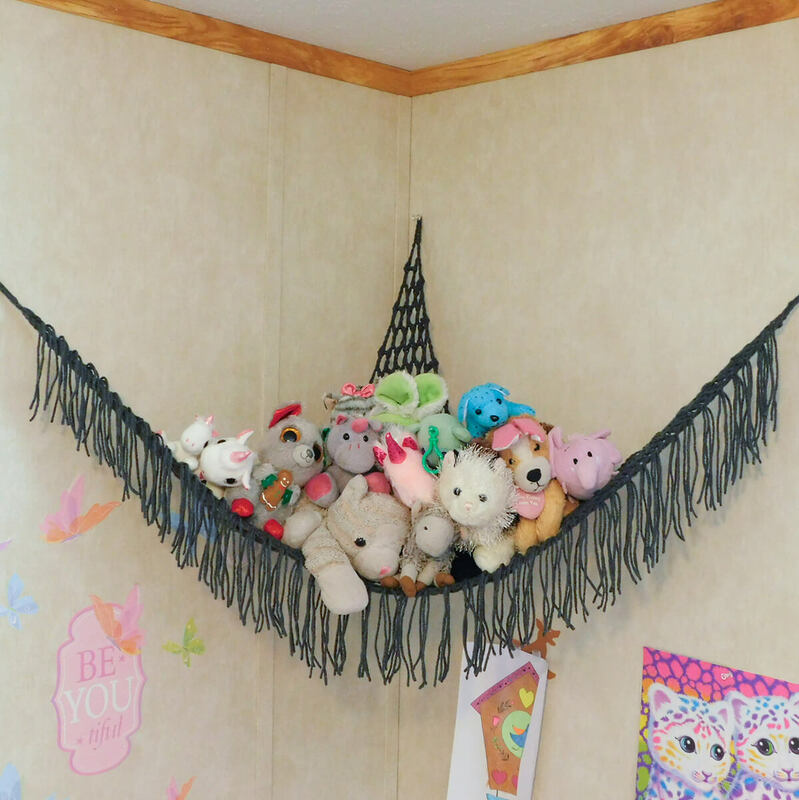 You can hang this whimsical handmade hammock on any empty wall space and at any height to create an easy and beautiful storage solution for stuffed animals. Made from cotton yarn, this soft hammock offers cute tasseled points to add personality and design. Pick your favorite color for whatever look you like. Getting all those toys sorted and organized can feel like a daunting task, but with the right equipment on hand and a positive attitude, your children’s rooms will be tidy before you know it. Whether you are looking for a large dresser like storage unit, or something that you can easily hang on the wall, this list has options for those and everything in between. If you have a whole empty room to work with, or just a small space, you can find a solution that works for you and your family with these 38 ideas.